Crank it up to 1,000 nits when the sun is out. LG, as per its tradition of teasing its upcoming flagship smartphones, has yet again dished out some tidbits about the G7 ThinQ ahead of launch next month. Specifically, the latest tease is all about the device's display, which will come in at 6.1 inches large with a QHD+ (3,120 x 1,440; 19.5:9) resolution -- part of which will indeed be occupied by a notch, as shown again by a recent @evleaks tweet and now confirmed by a couple of official screenshots. What's more interesting is that you'll be able to crank this LCD up to 1,000 nits -- beating the 400- to 700-nit brightness peaked by most other smartphones -- thus making it easier to read under bright sunlight. Additionally, LG claims that this mobile display uses "as much as 30 percent" less power than the one on the G6, though it fails to specify under what condition. 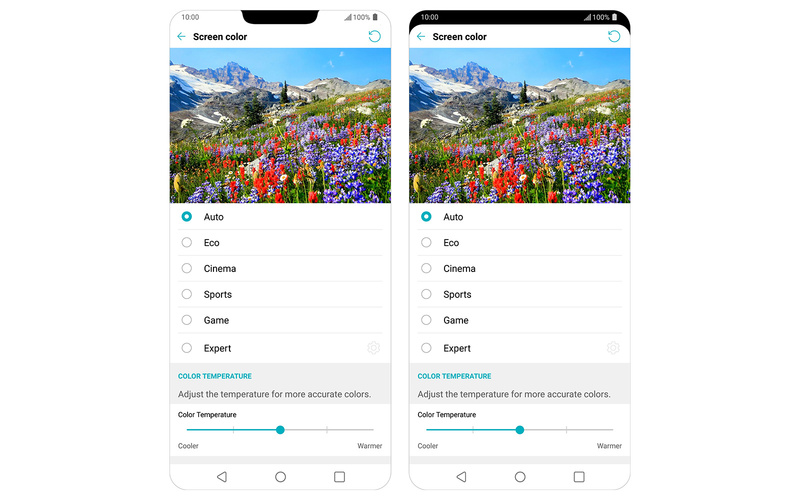 The company also mentioned the panel's support for 100-percent DCI-P3 color gamut, while the G7 ThinQ also offers six screen color modes -- Auto, Eco, Cinema, Sports, Game and Expert -- that are common on TVs, and these can be toggled automatically depending on the video content. We have a feeling that LG has more to say about this upcoming smartphone's screen, let alone the dedicated Google Assistant button that it'll apparently come with, but chances are we'll have to wait until early May for the full reveal.